Removes the portion of disturbance that exceeds normal operating voltage during a voltage surge or electrical line noise, ensuring constant operation. Dual-stage series-connected protection with tracking filter, for robust surge suppression. Form C (dry) contacts are standard on the ITHST to allow for remote monitoring. Green LED illuminated for indication of power at the output terminals. Terminals are clearly marked for easy identification. Surge protection pioneer since 1980, we have been designing and manufacturing industry leading surge protection (SPD) products. We hold the patents and intellectual resources that have been leading the way in critical equipment protection. 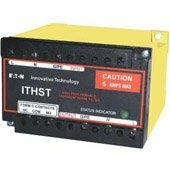 Eaton's Innovative Technology ITHST products are premium series filters with a hybrid MOV/filter design. They are applied to protect sensitive electronic equipment (critical loads) from damaging voltage surges, spikes and electrical line noise. Correct installation is critical for the proper operation of the ITHST unit. Please read the installation and operating instructions prior to installing the ITHST suppression device. Innovative Technology provides special Transient Voltage Surge Suppression (TVSS) applications for: Dedicated series load protection, telephone lines feeding the telephone switch, fax machines or modems, data communication lines, security lines (video camera cables, remote sensors), speakers and public address systems, antenna cables, residential and light commercial services. Since 1980, Eaton’s Innovative Technology has provided Surge Protective Devices (SPDs) to power quality equipment users around the world. Whatever your electrical surge protection need may be, Eaton’s Innovative Technology has a Surge Protective Device to fi ll it! Submittal specifications for the Eaton Innovative Technology HS Models Surge Protective Devices. Submittal specifications for the Eaton Innovative Technology HS-60A Models surge protective devices. Submittal specifications for the Eaton Innovative Technology HS-DIN Series Surge Protective Devices. Submittal specifications for the Eaton Innovative Technology HS-DIN-IP Models Surge Protective Devices. Submittal specifications for the Eaton Innovative Technology HS-P-SP Models Surge Protective Devices. Submittal specifications for the Eaton Innovative Technology HT Models Surge Protective Devices. Submittal specifications for the Eaton Innovative Technology IT-RSS Models Surge Protective Devices. Submittal specifications for the Eaton Innovative Technology LV48DC2LER Models Surge Protective Devices. Do you have the right protection in place?